I’m finally in Philadelphia and able to relax a bit, but the trip to get here was something else. It start on Friday morning, when I was woken up especially early by an exuberant little boy who wanted to play with his daddy. We played for a bit, and then I got ready for work. Next, I head to work and have two meetings before presenting to my colleagues on 30 tech tools in 30 minutes. We then had our final staff meeting, had lunch, and I finished up some last minute work for the year, and finally I headed home. Once home, I spent about 4 hours cleaning and packing as we are moving next week. Exhausted, my wife, son and I drove to the airport where we said our good-byes. With my son nearly in tears, I headed off for the obligatory 2 hour transfer from the check-in counter to the gate, through security. At 11pm, the flight took off. After 3 hours where I sat in a cramped chair and struggled to sleep, I arrived in Chicago. Looking at my itinerary, I realized I had an hour to try and get to the next flight, so I sprinted to customs, and then ran to catch a train to the right terminal, which unfortunately I just missed. I waited around for what felt like 15 minutes, and finally got on a train from terminal 5 allll the way to terminal 1. Arriving in Terminal 1, I found out that I had to go through security again, which took 35 minutes. Not entirely sure of the time, once I left security, I sprinted in my socks to my gate, to see the doors of the departure gate were already closed and no one left to board the plane. Sigh. I was fortunate to be rerouted to a 7:30am flight, which of course was on the other side of the airport. I took a shuttle bus, racing between moving airplanes and wondering if I could be accidentally squished. I got to the flight, got a chance to sit down, discovered I would have to pay for Wifi so I could update the EdubloggerCon people that I would be unable to present due to the flight delay. Finally, I got to board the flight, about 15 minutes delayed, at which time I was forced to endure another hour delay. Landing in Philadelphia 2.5 hours later than expected, and disappointed to be missing EdubloggerCon already, I found out that my bag hadn’t arrived in Philadelphia with me. I wandered from Delta to United to US Airways until I found someone helpful who told me that my bag would be on the 1pm plane from Chicago. I gave her the address of my hotel, and took a taxi to #TEDxPhiladelphiaED, stopping to get a hot dog on the way, the only food I’ve had at this stage in the past 15 hours. So now I’m sitting in the #TEDxPhiladelphia theatre, listening to a wonderful story from Barbara Allen, hungry, a bit smelly, and very, very tired, but also very grateful that I’m finally here for the International Society for Technology in Education conference. 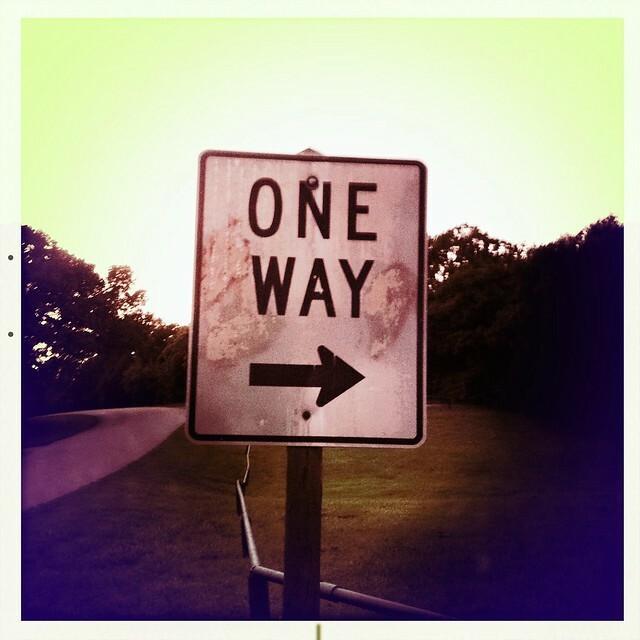 One basic assumption we often have about life is that there is only way to get things done. We struggle to see paths other than the one before us. Sometimes we are so blind to the alternate views of reality that we construct arguments against why they are possible, rather than accepting the evidence in front of our eyes. I recently discovered that there are at least 2 other ways of tying one’s shoes, for example, a fact I did not know for nearly 30 years. I have almost certainly witnessed literally thousands of different people tying their shoes over the years but have never noticed these other methods before now. I only noticed because I’ve been helping my son learn how to tie his own shoes, I’ve been reflecting on how shoes are tied, and then suddenly noticed that there are people who’s shoes are tied using completely different methods than what I’m familiar. If I can be wrong about something simple like shoes being tied, what else could I be wrong about? Maybe one reason why education reform is such a struggle right now is that the many sides of the debate can only see the direction with which they are familiar? I don’t think that my vision of what education reform should be is wrong, but am I being myopic? Every path has a fork. Sometimes you can double-back and try a different path, but you are never stuck on the one you’ve chosen. No path is one way. One thing is clear though, it is rare that two forks of a path lead to the same place. Let us remember that while we may not like the path that is being chosen for us in education reform, when the pendulum swings again, we can retrace our steps, and hopefully undo a lot of the damage that is being done. I’d like to help the people in charge of the reform see that they are on what I think is the wrong path, but I also need to keep my eyes open and look for the evidence they see that convinces them that they are on the right path. Without understanding why they are so sure of their direction, I cannot expect to be able to convince them of the error of their ways. Similarly, I must be open to the possibility that it is me who is on the wrong path. I don’t think that’s true though. I just think I have a different destination in mind. Is our k to 12 education system successful? If we want to discuss whether or not our k to 12 education system is successful, we must first examine its possible purposes. Suppose the purpose of our education system is to produce kids who are ready for college. Given that only 61.9% of students (in Canada) even attend college, and that not all of those people complete college, then our system is failing at least 40% of its youth by this measure of its success. What if instead the purpose of our education system is to produce kids who participate actively in democracy? At the very least, voting in an election should demonstrate an active participation in democracy. Given that in the year 2000 only 22.4% of youth aged 18 to 20 voted, and that this number has been decreasing steadily since the 1970s, it should be obvious that in this possible purpose of education, we are failing dismally. Another possible purpose of our education system could be to produce students who are literate and numerate. According to government statistics, 46% of Canadians are not literate enough and 55% of Canadians lack sufficient numeracy to be successful in society. Clearly we are failing many people in this respect. Perhaps our education system is designed to produce people who are critical thinkers, or alternatively, life-long learners. Without literacy and numeracy skills (see previous paragraph), one could easily argue that it is extremely difficult to be a critical thinker, or a life-long learner, so we are likely failing many people with these other two possible purposes of education as well. Other possible purposes for our education system could be to indoctrinate our youth with our societal values, create compliant citizens for a factory model of work, or to act as child-care for families where both parents work. Finding statistics to verify that the first two of these purposes are being met is difficult, given that it is rare that anyone admits that they could even be purposes of education. As for the successfulness of our system in acting as child-care, it seems that it is an awfully expensive way to provide child-care, but it is true that our education system does provide many hours of supervision each day. Personally, I don’t think that the last three purposes of education, which might be the only ones in which we are being successful, are sufficient purposes of education. We must do more than merely train our youth to be compliant, teach them how to be nice people, and provide child-care for parents. I’m a strong supporter of our current system, and I wouldn’t recommend that we tear it down. However, I don’t think we can pretend that it is working as it should, under any definition of success. Something needs to change. After reading this Global and Mail article shared by Chris Wejr, I realized I had a serious objection to the phrase "learning loss that happens over the summer months" as suggested in the article. The problem is that kids learn lots of things during the summer, they just aren’t generally learning academic skills during those summer months, except for those unfortunate souls enrolled in summer school. I remember learning how to swim, how to ride a bicycle, how to complete the computer game Might and Magic II, how to organize times to meet up with my friends and many other fun things. I was a reader, so I also spent much of my summer reading. However, I challenge the notion that kids are learning nothing during the summer; they just aren’t learning the skills schools consider valuable. If we find that there are kids who are not able to engage in these kinds of unstructured learning activities, we should make these types of summer-time activities more accessible, not take away the summer. I’m conducting a poll to find out what night would be the best for a regular #BCed chat. Vote below (and see the results). This chat would be open to all interested in chatting about education in British Columbia. I think it would be held about every two weeks at this stage. @MrWejr has volunteered to co-moderate the chat with me. If you are interested in helping moderate the chat, please contact me. I’ve created a separate wiki to keep track of the chat archives instead of my blog. We will also post suggestions for future topics, and useful information for getting started with Twitter. Your browser doesn’t support iFrames 🙁 Vote for this poll <a href=”http://twtpoll.com/sn3vyh” title=”here” target=”_blank”>here</a>. In many ways this comic from XKCD describes to me the dichotomy between the neo-Liberal 21st century personalized learning model, and the constructivist learning model. The Magic Bus uses an constructivist approach to learning. In each episode, Ms. Frizzle leads the students through investigations of different scientific ideas through magical field trips. The students lead the process, and Ms. Frizzle uses her questions to draw out their thinking, and to help students decide on the direction of the bus. Often she leads the students through the scientific principles, but she lets them come to their own understanding of the science, while helping to correct their misconceptions. In the neo-Liberal model, students absorb content through online courses, and the personalization comes in through what pace they are learning the material, and what resources they need to be indoctrinated. One of the primary purposes of technology in this mindset seems to be to reduce the role of the teacher in leading the child through learning, both for a cost-savings effect, but also to reduce the natural tendencies of teachers to indoctrinate children with their own moral values. Personally, I’d hate to see the Magic School bus model of learning derailed to meet a corporate need for compliant citizens. Videos used to help explain concepts, or as part of a pedagogical approach of individual teachers is okay with me, but as a vehicle for dehumanizing education is entirely inappropriate. If we are going to use technology in our schools, I think it behoves us to recognize both of these arguments for what they are, a fundamentally different approach to education.